Mouth: Along the same lines as the nose, but not as sweet as suggested. Very round. Zesty and nutty, with bitter herbs. Medium body. Finish: Fairly long - lemony, nutty with hints of peat. Some juniper & orange. Probably better off getting the 12yo if you can find it. Not the peaty/salty Springbank notes you might expect. Thanks for that closing comment. 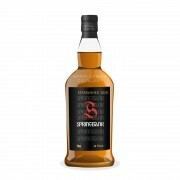 I've always had the impression that the 15 is not the Springbank for me, but I think this is the first time I've see anyone simply state it so clearly.